Ben Fogle was born in 1973. his father is the Canadian radio & TV vet Bruce Fogle and his mother is the actress Julia Foster. He attended Bryanton, a public school in Blandford, Dorset and, after completing his A-levels, spent a year working in an orphanage in Ecuador. Although he grew up in England, he spent long summer holidays in Canada, at his grandfather's hand-built wooden house in Ontario. Ben Fogle's early career was as the picture editor of Tatler magazine, but that was to end when he, and his black labrador Inca who was allowed to go with him, became a part of the BBC's 'reality TV' programme Castaway in 2000. It brought him much public recognition as, along with 35 others, he was marooned for a year on Taransay, a tiny island in the Scottish Outer Hebrides. 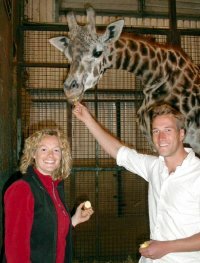 Fogle became popular with the viewing public and this led to him being offered, in 2001, a job as presenter of BBC's Animal Park, a wildlife show from the Longleat Safari Park. "It might be the start of a TV career, but it depends on how well I do," he said at the time, little realising that it would open the way for all the TV projects that have now made him a household name. Animal Park became a regular series, and with co-presenter Kate Humble, followed the fortunes of the animals at Lord Bath's Longleat home. 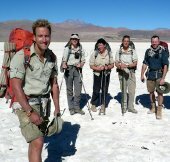 Ben Fogle has found himself much in demand as a presenter, hosting Crufts Dog Show, Country File, One Man and his Dog and Extreme Dreams, where he gives members of the public their chance to go on a journey of a lifetime to some of the world's most extreme environments including the Kaieteur Falls in Guyana and Mount Kilimanjaro in Tanzania. In addition to writing a column for the Daily Telegraph and articles for other newspapers and magazines, he now has three books to his name. The first was The Teatime Islands (2003) where he fulfils a childhood dream to meet the people of the far-flung islands of the British Empire like Tristan Da Cuhna and Ascension. Then came Offshore (2006), also about islands, with Fogle visiting many islands around the UK coastline in search of one of his own! His third book The Crossing is the account of his participation in the Atlantic Rowing Race from the Canary Islands to the West Indies, which began in November 2005 and ended 49 days, 19 hours and 8 minutes later. 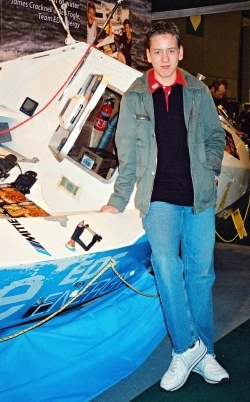 Although Fogle had little rowing experience, his partner in the race was James Cracknell, the winner of four gold medals at the Athens Olympics in 2004. This led to tensions as Fogle was in it for fun whilst Cracknell wanted to win at all costs! They start as ill-equipped outsiders and finish as the first pair to cross the winning line. In 2006, he married Marina Hunt whom he met in a London park when they were both out walking their dogs! Ben Fogle has a real thirst for outdoor sports and in his time he has been a regular skier, a horseman, is qualified as a diver, a coastal skipper, a dinghy sailor and a pilot. He has been dog-sledding in the Arctic and underwater shark-feeding in Fiji. 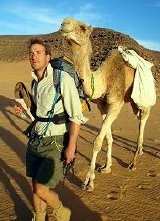 In 2004, he completed the 150 mile 'Sand Marathon' in the Sahara Desert to raise money for the WWF. All ended happily as the pair eventually made it to Antigua. They just missed out on 2nd place overall, but as they were the first 'pairs' boat to cross the line, they claimed the win in their class. Their boat was The Spirit of EDF Energy, a 25' long Challenge Class ocean boat, and the two men rowed for 24 hours each day in alternating, 2-hour shifts. There were high points like rowing alongside dolphins, but some terrifying moments as well. They encountered a hurricane; their radar system failed and they nearly collided with a Russian tanker; they were also attacked by a shark. The islanders had to build a community, live off the land, use 'alternative' energy, as well as filming themselves doing it. the water yards from the boat "surrounded by waves as big as houses"! Eventually he was reunited with the boat but much of their equipment was lost. In 2006 he won a celebrity boxing match for BBC's Sports Relief after receiving coaching from Frank Bruno! 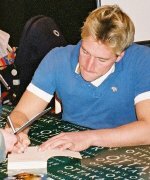 I met Ben Fogle at the NEC's Outdoor Show in 2006. He gave a super talk about the Atlantic Rowing race and he signed some things for me. I also saw the boat that he used for the race. the night before, but armed guards and helicopters still patrol the course to protect the runners. 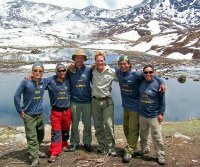 The following year, Ben travelled for eight weeks along the spine of the Andes from Ecuador in the north right down to Chile. The journey included rainforests, one of the world’s toughest mountains, the world's deepest canyon and the world's driest desert! 15,500'. It was all part of a BBC programme called Extreme Dreams. most hostile conditions. Fogle, Cracknell and Coats slept in a small three-man tent that was lightweight, yet able to withstand the bitter Antarctic storms. The three successfully reached the South Pole at 3.30pm on 22nd January 2009 having travelled 473.6 miles during the race and finished in 2nd place, just over 20 hours behind three Norwegian long distance ski experts. The race took them 18 days, 5 hours and 30 minutes to complete. Click here to go to the event website.